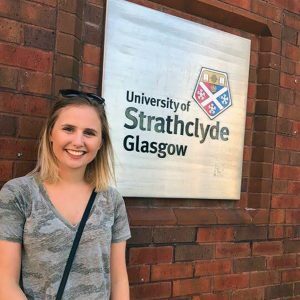 Kimberly Bracht is a returning study abroad students from Strathclyde University in Glasgow, Scotland. She is a senior majoring in Interior Architecture with a minor in Sustainable Studies. IPC: Why did you choose to study in Scotland? KB: I chose Glasgow to study abroad because of the rich culture and architecture unique to that city. KB: I believe that studying abroad opens up a completely new perspective in terms of what subject you are studying. For me, that was architecture, and getting to experience architecture rather than glancing at it online or in a text book was truly amazing.